UPDATE 14 January: Outcome of the vote. You are probably very familiar with the widespread and aggressive advertising of formula brands in Europe. 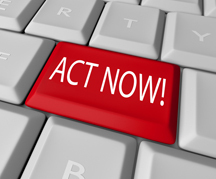 You can act now to stop it – jump to campaign action. 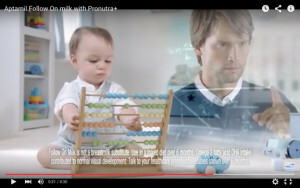 The screenshots left and below are from a current peak-time television advertisement for Danone’s Aptamil brand in the UK (also on youtube). It implies that giving your child this follow-on formula milk will give it the strength, stamina and balance to become a ballerina and the mental aptitude to be adept at calculus. Fortified milks are frequently high in sugar and are likely to contribute to higher energy intakes, which may contribute to chronic disease, and the voluntary fortification of foods and drinks needs to be questioned as there is increasing evidence that giving additional nutrients to those who do not need them may have adverse consequences. WHO and the NHS say these milks are unnecessary. The Consumer Association has calculated parents waste £500 a year buying them (Daily Mail report). Of course, mothers who breastfeed don’t need these milks either, and are providing their babies with optimal nutrition from birth, protecting their own health and saving money. We have won cases at the Advertising Standards Authority over misleading claims for follow-on formulas and growing-up milks. Yet cynical companies like Danone can get away with suggesting they will turn babies into ballet dancers and mathematical geniuses because the European Union Regulations are too weak. The good news is the Regulations are being updated. We have prompted some improvements to the new Delegated Acts drafted by the European Commission, but the bad news is they still won’t stop this advertising and other harmful and misleading practices. There are also concerns that the Commission is allowing these products to have too high sugar levels. (Full details on Patti Rundall’s Policy Blog). There is one final chance to improve the European Commission’s proposals because they are being scrutinised by the Environment, Public Health and Food Safety committee (ENVI) of the European Parliament right now. Keith Taylor MEP has tabled three Objections to the Delegated Acts as they currently stand. If the ENVI Committee votes FOR Keith Taylor’s Objections at their meeting on 14 January, then the full Parliament will be able to vote and hopefully send the Delegated Acts back to the Commission for improvement. So if you are in Europe ACT NOW and contact the MEPs from your country on the ENVI Committee. The list will open in a new window if you click here. Find your country, click on the MEPs names for their contact details (you can email and, in some cases, send a message on Twitter and/or Facebook). It is best to use your own words as MEPs will take more notice. Please support Keith Taylor’s Objections pursuant to Rule 105 on infant and follow-on formula, food for special medical purposes and baby foods at the vote at the ENVI Committee on 14 January. The government has endorsed the International Code of Marketing of Breastmilk Substitutes and subsequent, relevant Resolutions of the World Health Assembly, but the Commission’s proposed Delegated Acts fall far short of these measures. Weak EU measures undermine the government’s attempts to enforce the Code and Resolutions, which are intended to protect all mothers, however they feed their children. Misleading marketing of breastmilk substitutes and other baby foods is widespread and misleads parents, carers and health workers, whether breastfeeding or not. You can give your own examples of advertising that is misleading and rips parents off by encouraging them to buy unnecessary, expensive products that do not have the claimed benefits and may actually be harmful to health. Donate or become a member to help Baby Milk Action run campaigns, monitor baby food companies and brief the European Commission, MEPs and other policy makers. Please act to strengthen restrictions on advertising of baby foods and formula in order to protect the health of the population. We very urgently need stronger rules in the EU. rules on the marketing of baby food and allied products. Without firmer rules, the next generation is in danger! Vote for good health for babies. Leting formula producers work with no restriction will influence breastfeeding rate och the Health of babies. As a retired midwife, I feel it is so important to encourage breastfeeding, for all the health benefits for the child & mother. Currently, the sophisticated & smooth marketing of formula milk actively misleads families away from breastfeeding to buy unnecessary, expensive, & potentially harmful formula & follow on milks. Hence, we need stronger rules in place to stop this form of advertiing. Please support Keith Taylor’s objections to rule 105.
back to the Commission for improvement. Vote for good health for babies. Letting formula producers work with no restriction will influence breastfeeding rate och the Health of babies.